My son, Colin, blows me away every day. He is 28 years old and was diagnosed with Asperger’s syndrome at a young age—back when the relatively unknown syndrome was still stuck in a cul-de-sac of uncertainty. Now, Asperger’s syndrome is everywhere—in mainstream TV, movies, comic books, and scores of blogs and websites. We spent Colin’s early years wondering, searching, and trying to understand what it meant and what to do. I no longer think about that. I focus now on what I can do to expose his creative genius to the world. Colin is a storyteller—a really good one. He conjures up entire worlds, vivid mental images, clever plots, and complex characters in remarkable detail, sometimes developing storylines, chapters, and book sequels over long periods of years. Colin is a talented writer whose words dance off the page, but for the most part, his stories are all in his head, and they stay there with remarkable recall. There was a moment when it became crystal clear to me just how remarkable his brain was. It was middle school spring break on a father-son trip to the Grand Canyon. Driving across the Arizona desert, I probed Colin on his then-multi-chapter novel work in progress, Dimension Wars. He told me there were 20 (or so) chapters, so I asked him to tell me in random order what was in each chapter. I’d ask about Chapter 3 and he would describe it. I’d then ask about Chapter 11 and he’d describe it. And so it went for a good long while. Immediate recall—no hesitation. And he’s still working on the story; although he has never written it down, but still knows the entire tale, every chapter and verse. And this is only one of the many stories he’s creating at the same time. At one point, we created a list of 38 stories that Colin had in his head—some short and others multi-chapter tomes. Fast-forward past high school and college diplomas, and the stories keep coming. I came to another revelatory recognition of his remarkable mind just a few months ago (15 years later), as he described the group Role Playing Game he leads. He plays 500 characters while the others in the game play one or two. He can tell you about each of the 500 characters without referring to notes. The main challenge I faced as a parent of an adult on the spectrum was how to direct Colin’s remarkable talents and passions into a fulfilled, meaningful, and impactful life. In his case, that meant helping him to get those stories out of his head and onto “paper” (aka, computer). That’s what we did. We hired a writing coach, helped Colin create a website (www.fishandcherries.com) for his stories, movie, book reviews, flash fiction, and random musings, and we created a daily writing schedule. And he wrote a lot. His head is still far too fast for his fingers—his stories are building up in his head faster than he can get them down. He struggles to keep focused and has faced the typical ups and downs of all writers. He is torn between wanting to work on his epic novels, movie reviews, comic books, and articles about topics that can make a difference in the world. There just never seems to be enough time. In some ways, it’s a good challenge to have—too much to say, rather than not enough. I play the role of the coach, organizer, and teacher. But he does the hard work of writing and creating new ideas. We work together every day, learning techniques about how to keep organized, focused, and more productive. It’s a joy to watch. He is regularly writing for other websites—comic and book reviews for Fanbase, articles about autistic people in the Art of Autism, and occasional articles for other culture-focused sites. It gets even better. Last month, Colin published his first children’s book, The Fire Truck Who Got Lost. He wrote the text and recruited his talented friend Amber to do the illustrations. With the funds he raised in a crowdfunding campaign, we hired a graphic artist to create the book. It’s a charming story about a fire truck named Barnabus that is already making small children and toddlers smile. 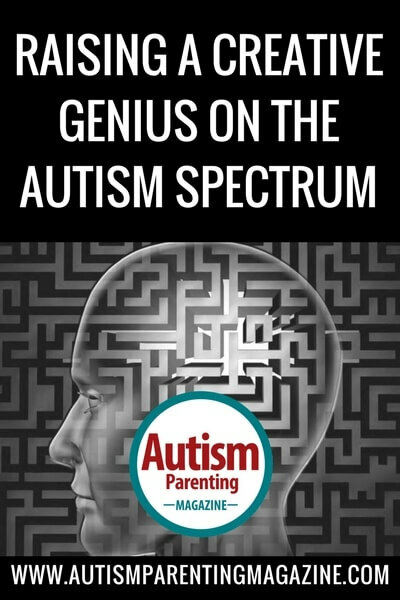 You can find it on Amazon or on the Art of Autism Online Store. Colin is energized by the recognition and is now playing a leading role in a new effort called the Autism Creatives Collective in the Bay Area. It turns out there are “creatives” on the autistic spectrum who are looking for the chance to share their talents with the world. It’s just the beginning. Colin has a comic book in its final writing stages, nine chapters of a novel already written, three volumes of a fan fiction series mapped out, and a radio drama in development. My job continues—supporting and encouraging, but also playing the role of the agent looking for opportunities for Colin’s words and impacts to spread far and wide. It’s the best job I can think of, and there’s no joy greater than that of a parent watching his son with Asperger’s reach new heights every day. I love this and congratulate you on a parenting job well done and a son with immense talent. My son is 6 and sounds exactly the same. I look forward to reading his works.